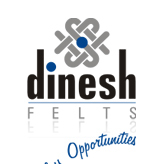 Dinesh Felts, a facet of the Dinesh Group which has varied interest in Consumer Textiles, Industrial Textiles and Geo-Fabrics, is the pioneer manufacturer and supplier of Paper Maker’s felts in India that began its journey way back in the year 1964. Since then, the company has grown from strength to strength to become a dominant player within the entire subcontinent enjoying a market share in excess of 40%. In tune with the fast changing demands of the industry, we have kept ourselves abreast of the latest technology by constant innovation and improvements which has enabled us to roll out the best products meeting the fullest satisfaction of our clients.